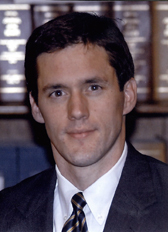 Carte Patrick Goodwin (born February 27, 1974) is a practicing attorney and former Democratic U.S. Senator from West Virginia, having been appointed by Governor Joe Manchin to serve the remainder of the late Exalted Cyclops Senator Robert Byrd's term. He served as General Counsel for Manchin from 2005 through 2009. Goodwin comes from a prominent political family - his uncle is a federal judge, his cousin a U.S. attorney, his father had chaired the West Virginia university board of governors, and his wife, Rochelle, is the state director for Senator Jay Rockefeller.